Generalised Anxiety Disorder is the condition whereby an individual will feel fearful or anxious on a long-term basis. Certain symptoms may occur intermittently but, for the most part, the condition is based upon stress felt in the home or in the workplace. Roughly one in fifty people suffer from the condition and the reasons for the onset of the illness are not understood. Again, for a reason that doctors are yet to determine, more women suffer from the condition than men and it normally manifests itself when a sufferer is in his or her twenties. There are however, certain factors that doctors have identified as playing a part: these may include: Childhood trauma – such as the death of a parent or being the victim of sexual abuse. Or a family crisis that has been unresolved which has led to high levels of stress. Again as with many of these stress related problems a sufferer can experience more than one of these symptoms at any one time. In order for a doctor to diagnose that you are a sufferer of Generalised Anxiety Disorder it is normally taken that the condition exists in a sufferer if the symptoms have been in evidence for a period of six months or more. Again, in attempting to diagnose the condition, a doctor will try and rule out other possibilities such as suffering from a panic disorder or depression. Side effects of prescription anti-depressants. It has also been proven that people who suffer from GAD are often likely to smoke heavily and have a high alcohol intake. Your doctor might well suggest if you are diagnosed with Generalised Anxiety Disorder that you give up smoking and cut down on your alcohol intake as these are also factors that can make the condition worse over time as well as obviously having an effect on your health in general. Generalised Anxiety Disorder can be treated and with the correct treatment can be something that will only reoccur in a mild form – if it reoccurs at all. However, without the correct treatment the condition can result in the sufferer not being able to function correctly, in either the workplace or the home environment. One of the ways in which the disorder can be treated is to use what is known as a talking treatment. This may include Cognitive Therapy – a treatment that allows the sufferer to think through their problems and to also identify the triggers – or signs that can bring about an attack of the disorder. 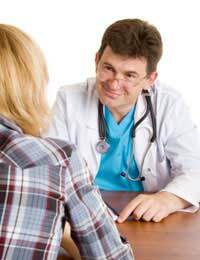 There are, of course, medications available that are prescribed to help treat the disorder but these are normally only prescribed as a last ditch attempt if all other means fail.Before embarking on any course of treatment it is best to consult your doctor who will give you advice on which course of action is best to help deal with your particular level of Generalised Anxiety Disorder.